Equitable Life has abandoned its massive High Court damages claim against accountants Ernst & Young. The mutual insurer had claimed Ernst & Young had signed off its accounts without warning of the problems that brought it close to collapse in 2000. It had originally sued the accountants for £2bn but dropped part of its claim - worth £1.3bn - in July. 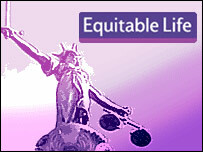 The Equitable may face estimated legal costs of nearly £30m. The life assurer closed to new business in 2000. Ernst & Young chairman Nick Land described Equitable's decision to abandon the case as a "complete vindication" adding the case was "ill conceived" and should never have been launched. "The past four years since the legal proceedings began have been a scandalous waste of time, money and resources for all concerned," he added. Ernst & Young's barrister, Mark Hapgood QC, told the High Court that the Equitable's decision to abandon the case was "the biggest climb-down in English legal history". However, in response Equitable chairman Vanni Treves said the board had a duty to its policyholders to pursue the claim against Ernst & Young. Equitable's case against the auditors was that it had failed to inform the then board of directors of the financial mess the mutual was in. But Mr Treves said the decision to drop the case was taken after the group's lawyers said there was a strong chance the court could rule that the former directors of the company would not have acted differently, no matter what advice was provided by Ernst & Young. However, the Equitable confirmed to BBC News that it would continue with its case against 15 of its former directors. The mutual claims the directors were guilty of mismanagement and are suing them for £1.7bn. The abandonment of the case against Ernst & Young will be a further blow to policyholders of the troubled mutual. Equitable nearly collapsed five years ago, when it emerged that it could not honour its life insurance policies. The mutual society got into trouble when it miscalculated how much it would have to pay out for its Guaranteed Annuity Rate (GAR) life insurances policies. The society tried to renege on promised payouts, but a ruling by the House of Lords in 2000 forced it to honour its obligations. Equitable savers have seen their life savings cut as a consequence of the society's troubles. The mutual had hoped to recoup some of the losses through taking legal action. Groups representing policyholders expressed anger at the fact that the Equitable now faces a £30m legal bill. "Policyholders are angry and disillusioned at the stewardship of the new board. It is a bitter pill. Equitable seems to be cursed," Paul Braithwaite of the Equitable Members Action Group said. "For three-and-a-half years policyholders have been held out the prospect of billions from Ernst & Young. Trust in the stewardship of Vanni Treves and Charles Thompson (Equitable chief executive) has gone."